Incredible boat journeys beside the mighty Tasman Glacier. One of only three tours of its kind in the world, you'll sail across the terminal lake and capture some amazing photographs. Glacier Explorers departs from the Hermitage Hotel in Aoraki/Mt Cook Alpine Village. 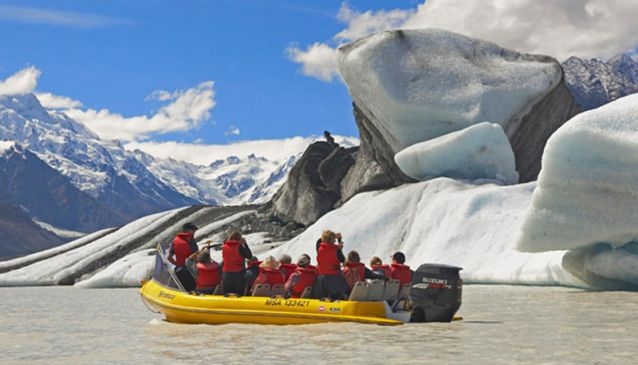 The Tasman Glacier is one of the few in the world to terminate in a lake, so visitors can actually cruise alongside it in the custom-built MAC vessel. Reach out and actually touch the 300-year old ice of New Zealand's largest glacier. Gigantic ice walls loom over you as you bob by, reminding you that over 90% of this incredible natural wonder, is below the surface of the lake. Your guide will provide insightful commentary on how glaciers and icebergs are formed, as well as information on plate tectonics, mountain climbing in the area, and the area's beautiful flora and fauna. Return transport and life jackets are included, and tours last approximately 2.5 hours. Just remember to bring a waterproof, plenty of sun block, and as big a memory card as your camera can hold!